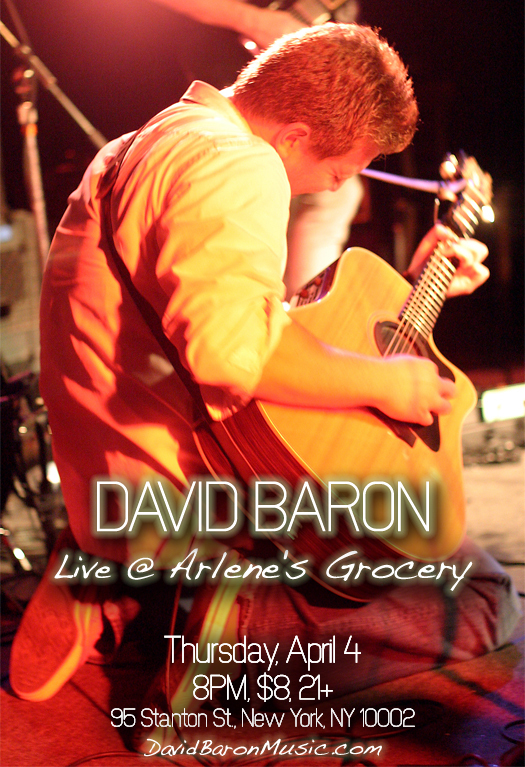 On Thursday, April 4, David Baron will perform with his full backing band at Arlene’s Grocery in Manhattan’s Lower East Side. Arlene’s Grocery is an institution in the New York City rock scene, having hosted such influential artists as Jeff Buckley and The Strokes. The concert will begin at 8PM sharp and is open to anyone aged 21 and over. Tickets are $8, and are available at the door and online at http://arlenesgrocery.tunestub.com/show.cfm?id=95843. For more information, visit http://www.arlenesgrocery.net/. 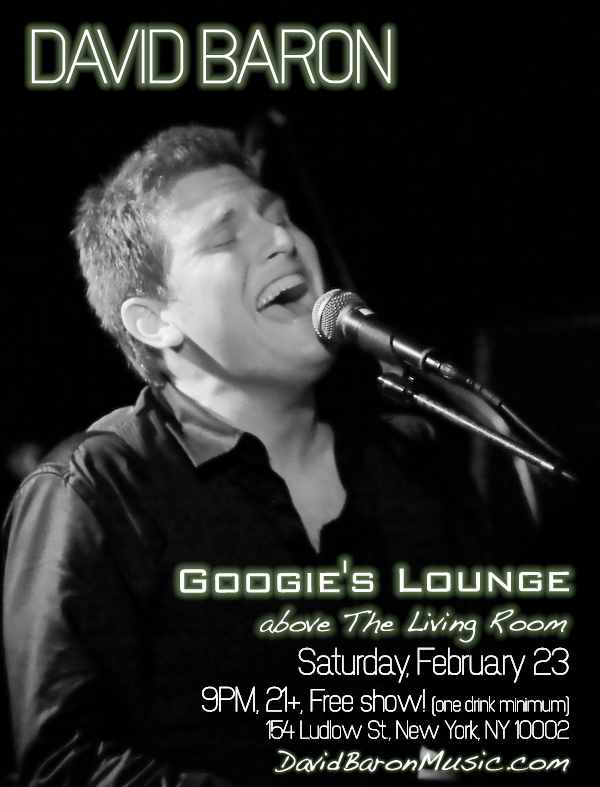 On Saturday, February 23, singer-songwriter David Baron will play a solo show at the intimate venue Googie’s Lounge. Located above New York’s famed The Living Room, Googie’s Lounge has become an important destination for the discovery of new artists. 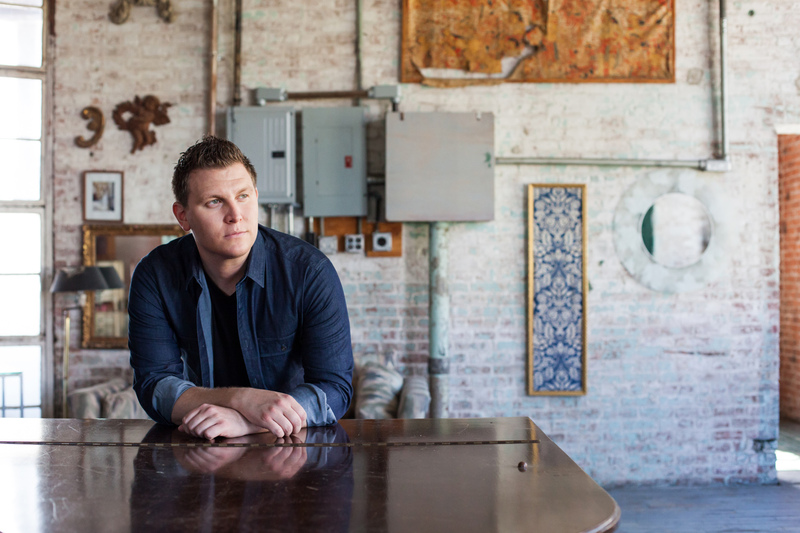 The concert begins at 9PM, and is a free show with a one drink minimum and a $10 suggested tip donation. For more information, please visit http://www.livingroomny.com/googies. 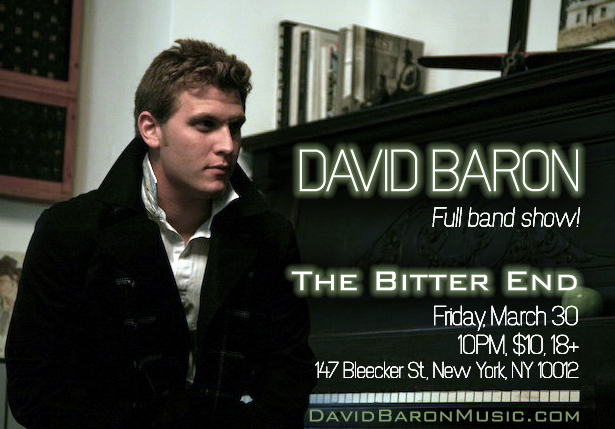 On Saturday, June 30, David Baron will perform with his full backing band at the legendary venue The Bitter End in New York City. Located on Bleecker Street in the heart of Greenwich Village, The Bitter End is New York City’s oldest rock club, and has hosted such influential acts as Billy Joel, Bob Dylan, and Lady Gaga. The concert will begin at 8PM, tickets are $10 at the door, and the show is open to anyone aged 18 and over with a valid I.D. For more information, visit http://www.bitterend.com/. 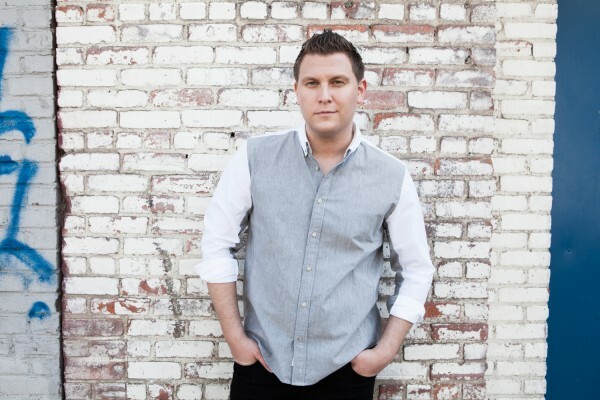 David Baron will perform with his full backing band at Molly Malone’s in Los Angeles on Friday, February 25. Molly Malone’s is an Irish pub and rock venue that showcases some of the finest musical talent in LA. The show will begin at 9PM, and will also feature local alternative pop band See Green. For more information, visit http://www.mollymalonesla.com/. 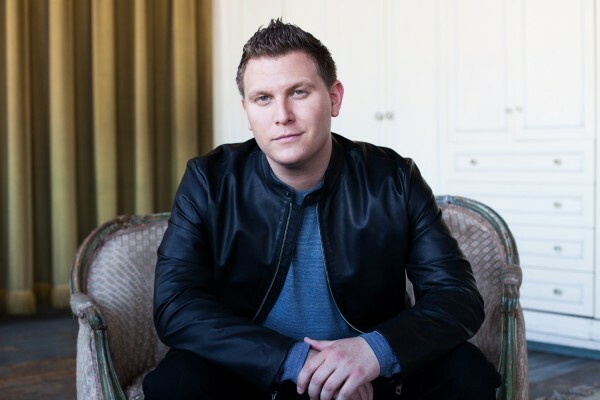 David Baron’s original song “Kids” off Baron’s self-titled EP (purchase here) is featured in the upcoming Ski Channel original movie The Story. Also featured in the movie are four songs from the debut EP Let It Rip by the Bryan Bros Band feat. 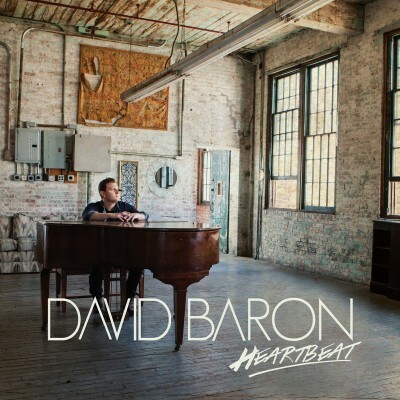 David Baron. The Story documents some of the world’s best skiing and the lives that have impacted (and been impacted by) the sport. To view the trailer for the movie, visit http://theskichannel.com/filmtour/. David Baron and Mike and Bob Bryan will also be performing at the Highlands Nightclub in Hollywood, CA on Sunday, October 24 at the afterparty for the movie premiere of The Story. The performance is scheduled to begin at 9:00PM, and will also feature other special guests. 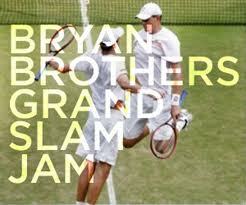 The Bryan Bros Band feat. David Baron and Counting Crows drummer Jim Bogios will play the 1st annual Grand Slam Jam benefit concert at Wokcano Lounge on Friday, October 22 at 7:30pm. The concert will also feature performances by Grammy-nominated singer Lisa Loeb, Pete Yorn, LA based singer Brett Dennan, Canadian Superstars Hedley, stars of the CelebrityCafé webisode series Bascom Hill, Geffen Records’ Young Tenor Griffith Frank (featured on the 9 soundtrack), and Michael Johns (American Idol 2008 Finalist). The concert is a benefit for Bogart Pediatric Cancer Research and the Bryan Brothers Foundation. The Bogart Pediatric Cancer Research Program is instrumental in providing foundation and funding to pediatric cancer research at the Children’s Hospital in LA. The Bryan Brothers Foundation is a non-profit organization developed by Bob and Mike Bryan that has supported over 30 charity causes. 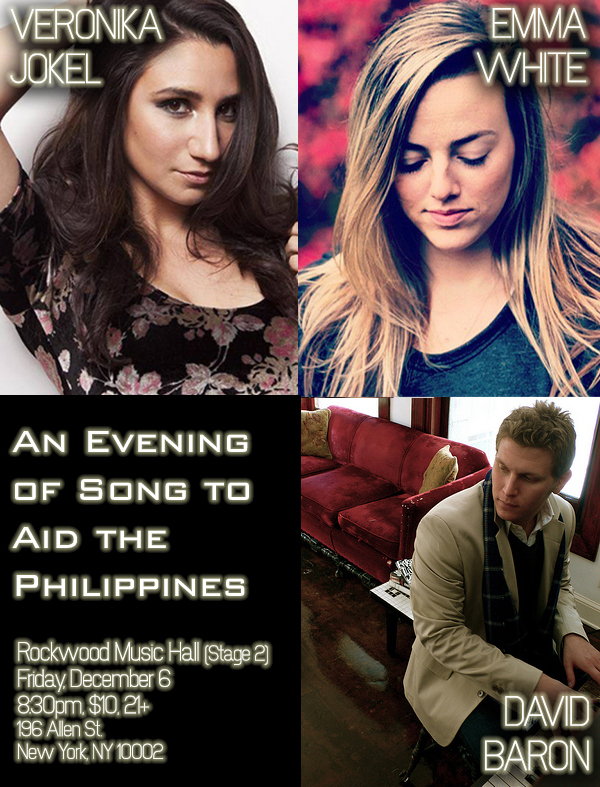 Admission to this benefit concert is provided by a $25 tax deductible donation at the door. With your donation, you’ll receive a FREE Grand Slam Jamarita (Margarita) provided by Metl Tequila. For any questions, visit http://www.bogartprogram.com/news/grand-slam-jam-concert, or contact the Bogart Pediatric Cancer Research Program at 323.330.0509.
Who: Bryan Bros Band feat. David Baron & Jim Bogios, Lisa Loeb, Brett Dennan, Pete Yorn, and more surprise guests.